All jobs start with a thorough inspection & itemized bid. Each job is prepped with sweeping or vacuuming, tape & masking of sensative areas (carpet,hardwood,furniture,cabinets,stainless)& light furniture moved. TILE/GROUT: For a general cleaning , a heavy duty cleaning solution designed specifically for tile and grout , is applied to a section of the floor and allowed to loosen built up soil.We then power scrub the tile & grout with a floor machine & special brushes. We then gently steam clean each section with a steam wand designed for tile & grout. This system rinses the dirt and cleaning solutions away with our powerful truck mounted steam machine. After cleaning, the floor is dried and our High Grade sealer is applied to the grout. RESTORATION: Is an additional process used on grout that has been stained by years of soiling or lack of sealing. This process is similar to the one above with an additional special cleaner that removes stains, brightens the color and returns the grout as close as possible to its original look. The cleaning solution is then rinsed with a special neutral cleaner, we then mop and dry, then seal. 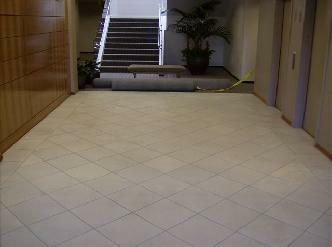 COLOR SEALING- This service is employed when grout is so stained it will not correct or when you just want a new color! After restoration cleaning and drying a colored epoxy sealer is applied to the grout lines. This method generally provides a permanently sealed grout surface. 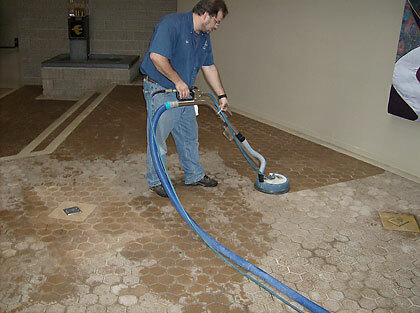 CLEANING : The cleaning process for STONE begins after a thorough inspection and prep of areas to be serviced. We start with a special stone cleaning solution, mixed specifically for cleaning each type of stone. The cleaning solution is applied to floor or countertop, it is then allowed a short "dwell time"on the stone and grout. We then agitate the cleaning solution suspending the soil in the cleaning foam. Next we gently steam clean rinse away all the soil and cleaning solution with our truck mounted steam machine. Each section is then mopped and dried in all the areas until the job is clean. SEALING: After the Stone is cleaned and completely dry. We then look for any areas that may need more attention. Prior to sealing these areas are touched up, allowed to dry and then the sealing can begin. Depending on what type of stone you have, the proper sealer is applied to the stone, again in stages,allowed to penetrate the stone and the excess is removed and dried. After the sealing process you should allow at least 4 hrs. before any traffic ensues. We can leave walk off paper in the areas serviced but foot traffic should be kept to a minimum. Complete curing of the sealer can take up to 48 hrs. after application. POLISHING : There are a few different methods for renewing the polish to stone. Diamond grinding,powder polishing and pad polishing are the most common. Depending on many factors , types of stone and conditions the proper method will be discussed at the time of your on site bid. Diamond Pads are the most common method and will usually achieve very good results with reasonable cost. We also have the ability to hone your stone to a flat finish instead of a mirror look. Our complete restoration service is available for Marble & Travertine which will leave your stone in near factory new condition, but is a very teadious process and is charged acordingly. 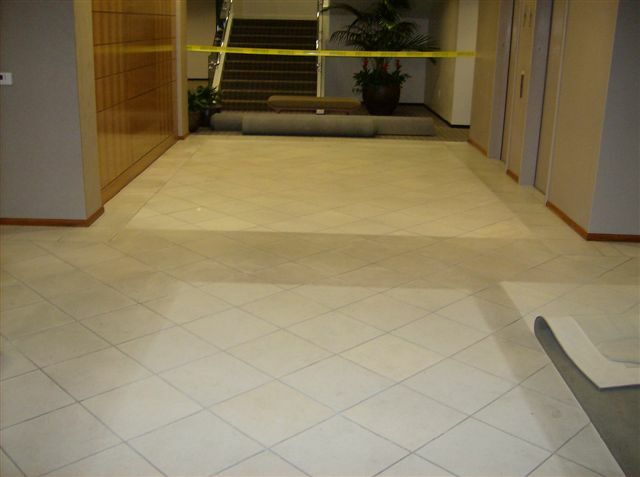 Uneven floors can be ground down and lippage removed then repolished or honed. 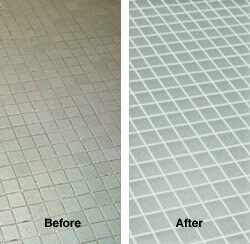 Shown above is a good example of a bathroom floor after cleaning,restoration and grout recoloring! Here we are steam cleaning a concrete paver floor inside a local Church prior to the application of an polyacrylic sealer. Below we have an example of heavily Worn & Etched Marble Countertop. to end result, a Restored Surface.